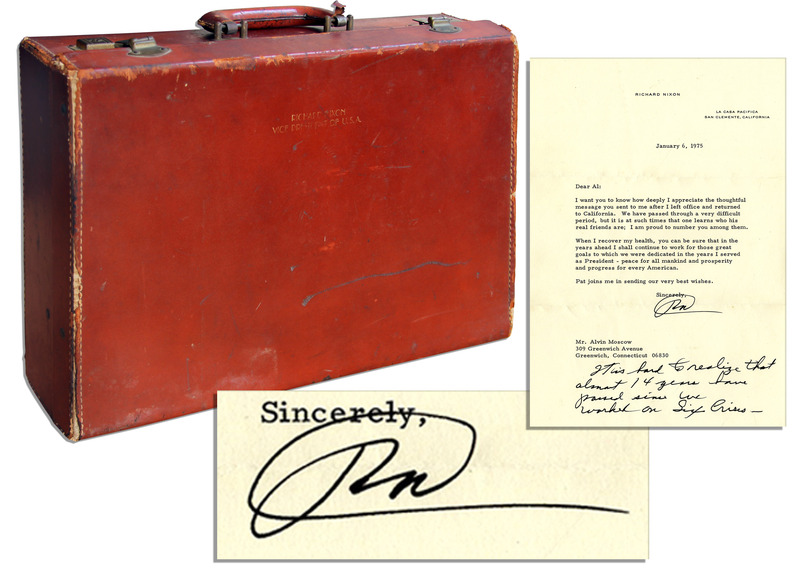 Briefcase owned and used by Richard Nixon as Vice President, containing a typed letter signed by Nixon not long after he resigned from office. Brick red leather briefcase shows plenty of signs of use and has Nixon's name and title printed in gilt; ''Richard Nixon / Vice President of U.S.A.'' Nixon served as Vice President under Eisenhower, from 1953-1961. Briefcase opens to reveal a typed letter signed ''RN'' on Nixon's personal stationery to Alvin Moscow, the head researcher for Nixon's book, ''Six Crises,'' to whom he gifted this briefcase after their collaboration on the book. Dated 6 January 1975, letter reads in full, ''Dear Al, I want you to know how deeply I appreciate the thoughtful message you sent to me after I left office and returned to California. We have passed through a very difficult period, but it is at such times that one learns who his real friends are; I am proud to number you among them. When I recover my health, you can be sure that in the years ahead I shall continue to work for those great goals to which we were dedicated in the years I served as President - peace for all mankind and prosperity and progress for every American. Pat joins me in sending our very best wishes.'' Nixon adds a sentimental autograph note to the bottom: ''It is hard to realize that almost 14 years have passed since we worked on Six Crises -''. Included in the lot is a copy of a newspaper article on the fire that caused Nixon and Moscow to be evacuated from Nixon's rented home in Brentwood while they were nearing completion on the book. Also included is a 10'' x 8'' photo of Nixon standing before a home that was destroyed in the same fire, with Moscow's autograph caption signed to verso. Briefcase interior has address labels affixed bearing Moscow's name. Briefcase shows heavy use by Nixon, with surface abrasions and loss of material to corners. Accompanied by a copy of a COA from Moscow.